You've learned how to create a simple conditional dropdown...but what if you wanted to take it one step further? What if you wanted to develop the form below? The good news is that, if you know how to set up a single conditional dropdown, you know how to set up cascading dropdowns. 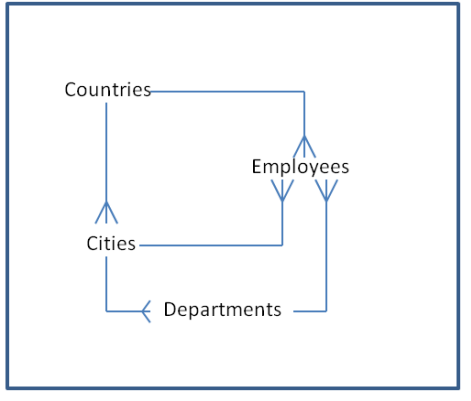 Note: These relationships will establish a conditional Department dropdown on the Employee form. 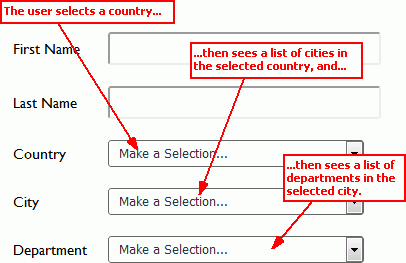 You can also set up conditional behavior on the Departments form, so that users can first choose a country to see a filtered list of cities. If you'd like to do that, simply follow the steps for creating a single conditional dropdown. Quick Base now filters the department list on the employee form, so that you see only those departments located in the selected city.